Do you want to spend less time working? Do you want to take on more business? Frans Technology Inc. is introducing the new Mercury Series controller, a new high performance controller for rotary engraving systems. 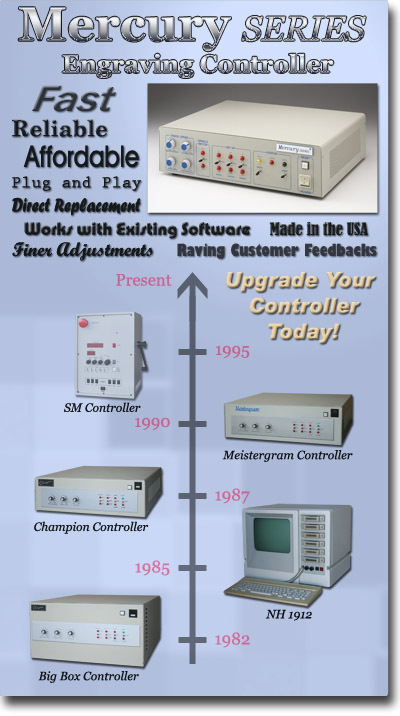 The affordable Mercury controller is designed to directly replace your current Meistergram or H-Square unit. Call us at 510-490-6890 for upgrade and trade-in information. The new Mercury Series controller will amaze you with its high performance. In fact it performs about twice as fast as previous Meistergram or H-Square models. Like a faster engine, the new Mercury controller will blaze through your engraving jobs in about ½ the time, saving you valuable time and money. The new Mercury Series controller is designed to work directly with your current engraving table and software - including all of your existing logos, fonts, and layouts. There is no need to worry about losing work when converting to another system. All your existing files will work as is with the Mercury Series controller. With new switches to control Z-axis travel (stroke and dwell) and finer depth adjustments (16 steps vs. 10 steps), you will have complete command of your engraver enabling you to create products with greater details. With its plug-and-play setup and familiar front panel design, you can start using the Mercury Series controller in minutes. The Mercury Series controller has helped our customers achieve their goals. Your engraving controller is a vital part of your business. Isn’t it time for an upgrade? >> Download Brochure in PDF format.